The Asus ZenFone 5 and ZenFone 5Z have been unveiled at MWC 2018 in Barcelona tonight, just as expected. Although both feature a dual camera setup with a flagship Sony IMX363 sensor with 1.4 µm pixels and a 6.2-inch display, the ZenFone 5 has a Qualcomm Snapdragon 636 processor inside, while the ZenFone 5Z is powered by the top-of-the-line Qualcomm Snapdragon 845 SoC. Earlier today, Asus introduced the ZenFone 5 mid-range phablet and the ZenFone 5Z flagship. 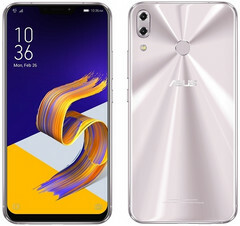 Although they both look the same and use the same flagship-level dual camera setup on the back, there is a big difference when it comes to the processor they use: while the ZenFone 5 is powered by a Qualcomm Snapdragon 636, the ZenFone 5Z uses the almighty Qualcomm Snapdragon 845 flagship processor. The Asus ZenFone 5/5Z comes with a total amount of 64 GB internal storage space, uses a 3,300 mAh battery and runs Android Oreo with Asus' ZenUI 5.0 on top. The list of other common specs that make these phablets worthy of our attention includes 3-axis electronic image stabilization, 24-bit audio, FM radio, dual 5-magnet speakers, a 3,300 mAh battery with BoostMaster and AI Charging, a Pro mode for the cameras, and many other AI-driven features. The colors available are only blue and silver for now. The ZenFone 5Z has a very attractive price considering its features, since Asus announced it would hit the market for only US$499. We have no information about the pricing of its less potent sibling, but we expect to see it hit the market for US$399 or less.